The Lamborghini Urus ST-X racing concept. “Lamborghini will debut a racing series for its new luxury SUV in 2020” is a sentence most of us probably never expected to read. But here we are, in this dystopian reality called life, wondering when we’ll wake up from the nightmare that is a world almost completely consumed by crossovers and SUVs. Crossovers and SUVs are great for people who have trouble getting into lower vehicles and who want better sight lines on the road, but racing luxury SUVs—and production SUVs in general, aside from purpose-built off-road vehicles—is still a weird concept. Weirdness is arbitrary, though, and it’ll probably be only weird for five more years before we’re looking at the “groundbreaking” 2025 class of NASCAR SUVs or something. Can’t wait. 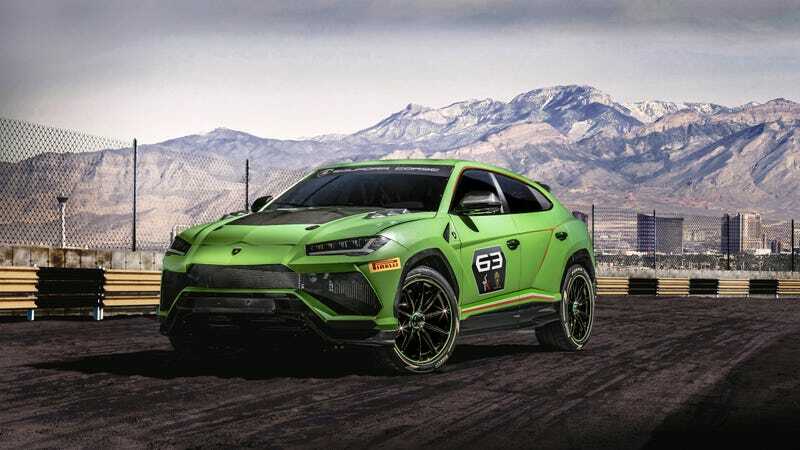 Anyway, the new Urus ST-X concept SUV is based off of the production Urus that offers 650 horsepower for a cool $200,000 or so, and Lamborghini said in an announcement that it’ll be the star of a “single-brand championship that combines race circuit and off-road track.” That last bit actually makes this seem worthwhile, like Formula E’s idea to race electric SUVs in the arctic. But it sounds like this Urus series will be more of a glorified customer-experience program, with Lamborghini saying it’ll go to FIA-approved tracks in Europe and the Middle East starting in 2020 with “an ‘arrive and drive’ formula designed to offer driver-customers a complete package.” That package includes a car and technical support during the race weekend, the announcement said. The car is different than the Urus models the “driver-customers” have at home, with the ST-X concept meeting FIA racing safety regulations thanks to additions like a steel roll cage, fire-suppression system and racing fuel tank. The concept also has larger air intakes to give the Urus’ twin-turbo V8 more fresh, crisp race-track air, a rear wing, and a 25-percent weight reduction. Don’t get too excited (?) about seeing the concept on track anytime soon, though. Lamborghini said the ST-X will make its track debut at the 2019 Lamborghini World Finals, which are a ways away—unless you consider it in terms of the approximate amount of time we have left before everything and probably everyone becomes an SUV, which, in the big picture, isn’t long.